Grand Master Victor Duc Phan was born on April 20, 1944 in Cho Lon, Viet Nam. He passed away at 7:58 pm on April 30, 2009 in San Jose, CA at the age of 66. He was a 9th degree black belt, was the second asian TKD tournament black belt overall champion and a much loved grandmaster at The Planet. This is his biography. 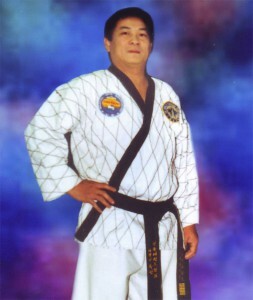 Grand Master Phan was the President of Than Phong The Planet Martial Arts Federation, as well as, the Director of Than Phong’s Headquarter in San Jose. Grand Master Phan was born in a traditional martial-arts family, where he started learning and practicing martial arts at a young age. In the early 1960’s when Taekwondo was first introduced to Viet Nam, Grand Master Phan studied Taekwondo under the late founder, General Choi Hong Hi and Grand Master Kim Byung-Woon, who is currently President of the KUKKIWON’s Technical Committee, World Taekwondo Federation. Grand Master Phan joined the Vietnamese Armed forces in 1965, where he served in the Air Force division. He first served in the Supply and Maintenance Unit and later transferred to the Political Warfare Unit, Martial Arts division. In 1975, after South Viet Nam fell into Communist hands, Grand Master Phan was sent to the so-call “re-education” camps from 1975 until 1984. Due to his passion for the Martial Arts, Grand Master Phan, after being released from the “re-education” camp, immediately started teaching Martial Arts to a small group of Than Phong Instructors and students, even with the Communist Government prohibition of Martial Arts still in affect. Grand Master Phan came to US in 1989, where he first resided in Rhode Island for short period of time. Later, when he settled in San Jose, he started teaching Taekwondo again. One of his former student from Than Phong in Viet Nam transferred his Dojang and 60 students to Grand Master Phan. Due to the large number of new students, he moved the DoJang to a bigger place at Umbarger Road and kept the Dojang running until today. With the encouragement and support from everyone, Grand Master Phan traveled around the world to countries such as France, Canada, Australia, and so on, to conduct Belt Promotion Tests as well as held seminars at local DoJang every year. In 2005, Grand Master Phan attained the rank of 9th Degree Black Belt in Taekwondo, and he also achieved the rank of 8th Degree Black Belt in Gumdo in the same year. In the many years of being president of the Than Phong The Planet Martial Arts Federation, Grand Master Phan has trained many students and instructors who won a lot of Championship in Taekwondo Tournaments, and had achieved many honors and recognitions for the Federation. Grand Master Phan dreamed about publishing a magazine on Oriental Medicine, Martial Arts Philosophy, and Heath. He believed that, with more than 60 years of Martial Arts experience, he can write a book that may help and benefit a lot of people. But he was not able to fulfill this dream before passed on. Grand Master Phan’s sudden death has shocked us, and the thousands of students in the Federation, as well as friends from all over the world. April 30, 2009, marks the saddest day in the hearts of everyone that knew him. * 1969 Viet Nam Armed Force Taekwondo Championship: Black Belt Team Grand Champion.